Lately, I been thinking a lot about this blog and the direction I want to take it in. One topic that always seems to be on my mind is content. For some bloggers, it seems like they have fantastic blog post ideas and great blog content coming out the wazoo! Now if your like me, then you may experience those moments when your laying in bed and come up with a great blog post idea. Then you wake up the next morning (with your alarm clock sounding like a siren) having no clue what day it is, let alone remembering your ''Da Vinci like'' blog post idea. So for those of us who may lack the never ending stream of wonderful blog content, a little push is what we need to get those creative juices flowing. Last year I wrote a blog post called 25 DIY Ideas For Bloggers. In that post I listed 25 DIYs that a person could make whether they were a craft blogger or fashion blogger for there blog. For some reason that post was really popular so I thought it would be fun to write a similar post but have it be for all my DIYers out there. 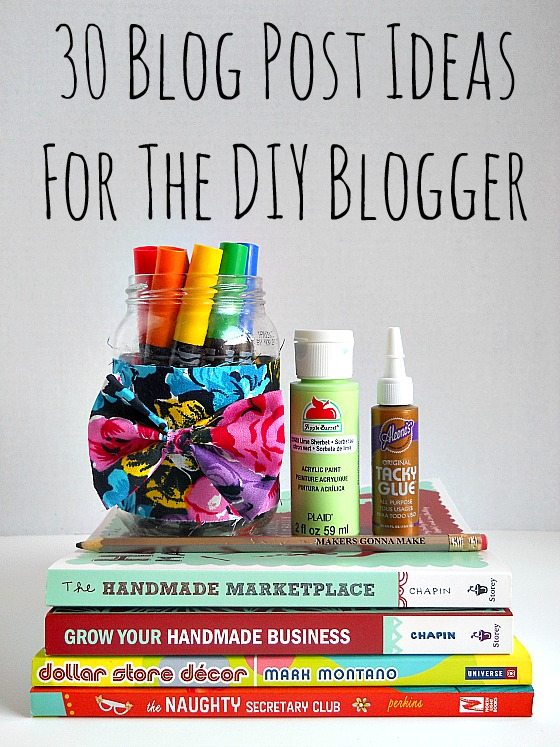 Today's post is 30 blog post ideas for the DIY blogger. In this list you will find ideas which deal with the general theme of crafting. Meaning, that there is more to the DIY blogger then just making DIYs! 4. Share your favorite DIYs from other bloggers. 5. Write a round-up post of your past DIYs (like 5 easy weekend projects). 6. Recreate a DIY you like from another blogger. 7. Share your favorite YouTube channels that are craft related. 13. Write about a craft trend and give your opinion. 15. Create a DIY series using one specific product or theme. 16. Try a new DIY / craft and share your experience. 17. Write a crafty ''get to know me'' post like this one! 26. Write about your dream craft room. 30. Write a Q&A post about all those crafty questions you keep getting from your readers. Well folks, hopefully these 30 ideas get those creative juices flowing! If your a DIY blogger, what are your favorite types of blog posts to write besides DIYs? this is amazing.. love this post! These ideas are fantastic! Thank you for sharing.